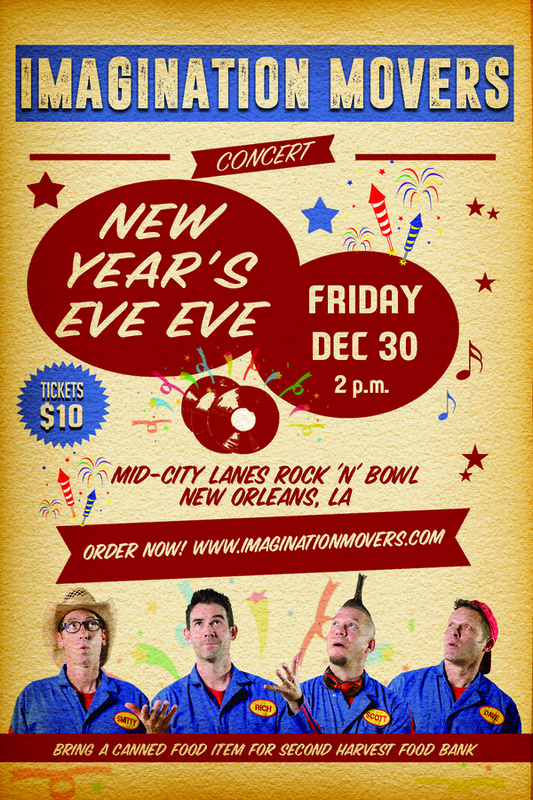 The Emmy-winning Imagination Movers -- stars of their own Disney Channel TV series -- will count down to 2017 a day early at a daytime rock 'n' roll extravaganza on Friday, Dec. 30 at Mid-City Lanes Rock 'n' Bowl. Best described as "the Red Hot Chili Peppers meets Blue Man Group for kids," a Movers show features original, highly interactive songs plus flying toilet paper, smoking trash cans, giant balloons and plenty more fun stuff. Don't miss hometown heroes Rich, Scott, Dave and Smitty as they share their irresistible melodies and all-around goofy fun with parents and kids. Showtime 2 p.m.